How to Create Alias in SQL Server? A SQL Server alias is the user friendly name. For example if there are many application databases hosted on same SQL Server. You can give the different alias name for each application. Simply Alias is an entry in a hosts file, a sort of hard coded DNS lookup a SQL Server instance. 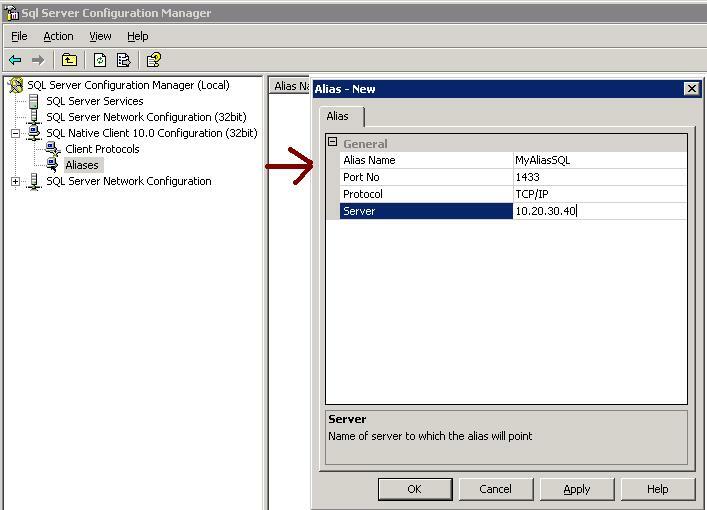 You can create Alias from Configuration Manager. Go to SQL Server Configuration manager – Go to SQL Native Client -> Right Click and SELECT New Alias from the popup window. Make sure On a 64-bit system, if you have both 32-bit and 64-bit clients, you will need to create an alias for BOTH 32-bit and 64-bit clients. This entry was posted in Database, DB Articles, SQL Server, SQL Server 2008, SQL Server 2008 R2 and tagged Create Alias on January 7, 2011 by Jugal Shah.